Kongma La Pass Trekking, Kongma La Pass Everest Base Camp Trek, Kongma La Pass Trek in Nepal. Best Season March/ Apr/ May/ Sep/ Oct/ Nov/Dec. 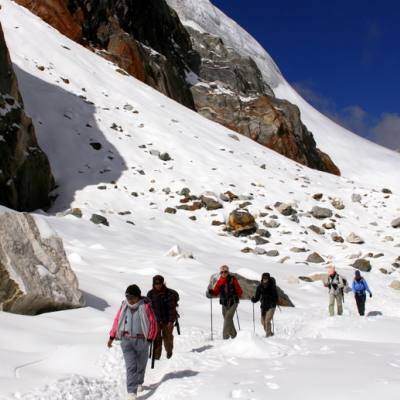 Kongma La Pass Trekking is the challenging off the beaten trekking trail in the Everest region. Kongma La pass (5540m.) is situated just above the Dingboche and south west of Mt. Everest, the highest mountain of the world. 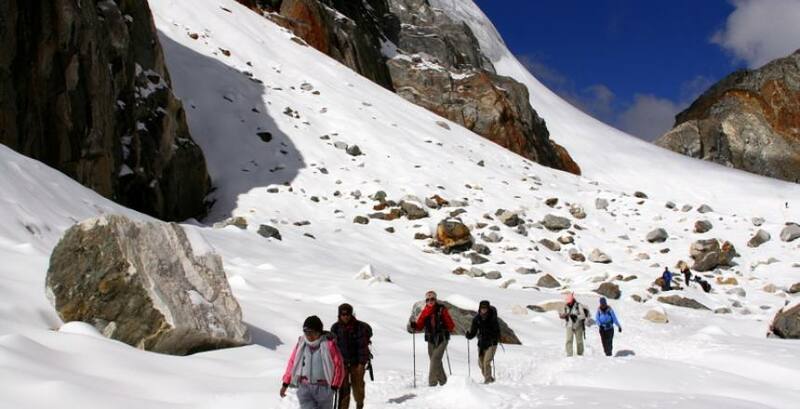 Kongma La pass trek offers the fantastic view of the towering mountains of the Everest region like Mt. Everest (8848m.) the highest mountain of the world, Nuptse, Lhotse and many more. From the pass you see the eye catching view of the Mt. Thamserku, Mt Amadablam, Mt. Kongtega and numerous peaks and glacial Lakes in front of yours eye within few kilometers distance. In this trek, you can get opportunity to enjoy the natural and cultural beauty of Everest/ Khumbu region. During the trek you visit many Sherpa villages which give the opportunity to get insight into their culture. In this trekking you can also hike up to Kala Pattar from where you can see the unparalleled view of the Mount Everest. You start your journey to Kongma La pass with the scenic flight from Kathmandu to Lukla. Kongma La pass trekking trail is the adventurous trail which requires the previous experience of trekking or crossing high pass. Among the three high passes of the Everest region Kongma LA pass is one of the most picturesque spectacular areas. From Lukla you follow the classic Everest trekking trail crossing famous places Namche bazaar-the gateway of Everest region, Tengboche, Dingboche to Kongma La pass. You pass through the blooming rhododendron forest, river valleys, and villages enjoying the natural scenery, Mountain View and culture of the people. From the pass you will be overwhelmed with the dramatic view of the Ama Dablam, Makalu and the Lhotse, Nuptse face. The best seasons to go for the Kongma La trek are spring and autumn season. 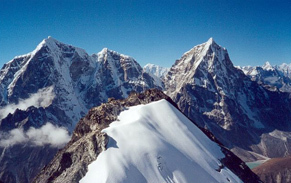 Main of this trip includes a high pass in Everest which is famous in the Everest region. 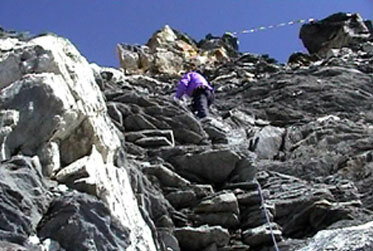 Kongma la pass trekking is a difficult trekking area of Everest region. You can pass the Kongma la pass and then trek to Everest base camp to explore the adventure of Everest. Khongma la pass trek get a 5535m altitude of Everest region. This is highest pass of Everest region. Kong-ma la pass trek is 12 days trek from Kathmandu. If you prepare perfectly to take your kongma la pass trek you will very easy to get your trip success. Not an only Kongma la pass trekking only all of the travel experience said that" if you have proper prepare to travel, there would be nothing to impossible." At the first to start your trip to Kongma la pass trekking, you take a short flight to Lukla from Kathmandu. In the main season, there will be quite busy. If there will be cancelled or delayed flight to Lukla. If there is cancelled your flight there is possible to take a sharing base helicopter to search out Lukla. For book your tickets don’t worry about it we will manage all about it. Route distance for walking this is normally 5-6 hour (approx) every day. Most of the follow same camp but if you want to walk more or you do not comfort to take a final destination of day to day camp. There will accessible food and lodge during the trek. Other main difficulty of Khomla pass trek is high altitude sickness. When you will cross above 3500m high there will little bit risk of high altitude sickness. When increase height there is also an increase risk of high altitude sickness. If you will suffering from high altitude sickness, you would stop walking and take secondary treatment. And take a decision about continue trekking or back. If you have serious condition there is available for helicopter rescue from any place of Everest region. Best time of kongmala pass trek with Everest base camp. Best time to kongmala pass trek is Oct to mid of Dec. this time is a suitable time to visit high pass trek of Nepal. During this time weather is unchangeable so there will be easy to trekking. The sky is clear; the climate is fit for our body. The mountain and other views are extraordinary during this trip. Everest base camp kongmala pass trek is one of the high pass treks so there are important things to know about best season of high pass trekking of Nepal. Mid of Dec to mid of February is a less busy season. During this time few numbers of people interested to go Everest kongmala pass trek. There is a normal temperature in day time but during night time there will be freezing cold and sometimes weather is changeable and heavy snowy at that time. March to June also the busy season of Everest region trek. At that time finishing winter and becoming spring season. And become day longer and warm day to day. So there will be easy to get high altitude activity. Khumbu’s landscape, glaciers and ice fall views from Everest base camp. Sherpa’s settlements, culture and religon,Tengboche monastery. Wild animals-musk deer,himalayan thar, National’s bird-Phasant and National’s flower Rhodendron. Day 14: Morning flight back to Kathmandu. 30 minutes. Day 02Kathmandu valley sightseeing Today you visit different historical and cultural sites of the Kathmandu valley with our guide. In the morning after having breakfast you go visit Buddhist and Hindu temples Boudhanath, Pashupatinath, Swayambhunath, which reflect the local culture and tradition of Nepalese society. Then in the afternoon you visit Kathmandu Durbar square and Patan durbar square. In the evening you will return to the Hotel. Day 03Katmandu to Lukla - Trek to Phakding (2700m. )In the morning you have a scenic flight of 30 - 35 minutes to Lukla (2800m.) from Kathmandu. During the flight you can see the snowcapped mountains and greenery field below. From Lukla we start our walk and head to Phakding passing through the forest and following Dudh Koshi River. In Phakding you can climb to the Gompa to see your first view of the high peaks. O/N at Phakding. Day 06Namche to Tengboche Monastery (3860m.) This day we leave Namche bazaar and walk for some time along the ridge and then descend to Dudh Koshi River at Phunkithanka. Then after crossing the bridge we ascend in the steep path up to the Tengboche. On reaching Tengboche you will see the local monastery. Tengboche have largest Monastery of Khumbu region. Overnight at guesthouse. Day 07Tengboche to Dingboche (4350m.) From Tengboche the trail drops to Debouche, crosses another exciting suspension bridge on the Imja Khola, and climbs to Pangboche amongst thousands of Mani stones. Our uphill trek continues, taking us to the quaint traditional Sherpa village of Dingboche with its exquisite views of Lhotse, Island Peak, and Ama Dablam. We take our time so we avoid getting affected by the altitude. Overnight at guesthouse. Day 08Dingboche to Chukkung (4700m.) Today you can enjoy another day for acclimatization with only two hours of walk. We will have trip to Chhukung valley via the Imja Khola valley. We get a marvelous view of the surrounding mountains, especially Lhotse’s massive south wall. Day 09Cross Kongma La (5500m.) 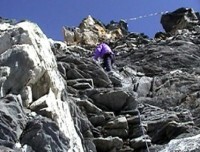 to Khumbu Glacier Lobuche This day is difficult as we cross Kongma La pass. At first we walk in the plain area in the valley and then ascend the steep path to the Kongma La pass amid the crags of this outlying ridge from nearby Nuptse. From the pass we descend steeply to the Khumbu Glacier. We cross the glacier and head to Lobuche. Day 10Trek to Everest Base Camp (5365 m.) then back to Gorak Shep (5180m.) This is another big and difficult day walk along the Khumbu Glacier and up to Everest Base Camp at 5365 meters, the closest you can get to Mt. Everest without mountaineering equipment. There will likely be a team there about to attempt the summit. The view of the Khumbu Icefall from Base Camp is spectacular. We return back to Gorak shep for the night. Overnight at guesthouse. Day 11Hike up to Kalapattar (5545m.) early in the morning and trek down to Pheriche (4120m.) This will be one of the most difficult yet rewarding days of the trek. Most of morning in this day is spent climbing Mt. Kala Patar, a small peak (by Himalayan standards) at 5555 meters. The ascent is demanding but the climber gets the most magnificent mountain panorama: Everest, the highest point on the planet at 29028ft, 8848 meters, towers directly ahead and on all sides loom the other giants, Nuptse, Pumori, Chagatse, Lhotse and countless others. We make a quick descent to Gorak Shep, a tiny hamlet at 5180 meters then trek down to Pheriche. Overnight at guesthouse. Day 12Trek to Namche (3440m.) A steep descent to the Dudh Kosi and another climb up to Namche Bazaar. Overnight at Guesthouse. Day 13Trek to Lukla (2840m.) Finally, we return to Lukla where the trek began, which will seem like a lifetime ago. Enjoying time to reflect on the trek as a group and the personal achievement of all those who took part. Also giving you time to explore the town. Overnight at guesthouse. Day 14Morning flight back to Kathmandu. 30 minutes. Enjoying your last glimpse of the mountains you have recently visited for one last time on the 35 minute Scenic flight back to Kathmandu. On arrival in Kathmandu we are met and transferred back to our starting hotel. Overnight at hotel. Day 15departure. The trip ends, our Airport Representative will drop you to the Kathmandu International Airport for your flight departure from Nepal.